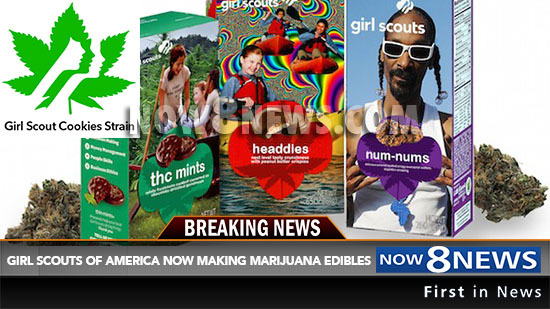 Colorado Springs, Co. – Girl Scouts Of America have been approved to enter medical marijuana dispensaries across the country. Their slogan, “There’s More to Girl Scout Cookies Than What’s in the Box” is now truly living up to its meaning. On April 20, 2016 (a.k.a. 420), three new flavors will be available to purchasers at their local dispensaries. Girl Scout officials acknowledge that the mission for these girls nationwide is difficult these days. With Girl Scout membership down 2% nationally this year, and cookies sales off pace, GSA admittedly had to do something to prevent them from being $1 million short of their projected sales revenue. According to Colorado state officials, the state made $7.34 million from marijuana dispensary application fees alone. The projected revenue for a marijuana dispensary in Colorado can range anywhere from $100,000 per year – $1 million per year. Num-Nums, Headdies and THC Mints are projected to bring in approximately $8.5 million in the first year alone. Try making that selling cookies in front of the grocery store!